In these words, we see history’s best-known comics creator in full spectrum. There is the inarguable fact of his genius for penning narration and dialogue, for conjuring words that could waltz, jitterbug, and tango. There is the fictional universe he co-created, a cornucopia of concepts that eventually reshaped the entire entertainment economy. And then, it gets complicated. 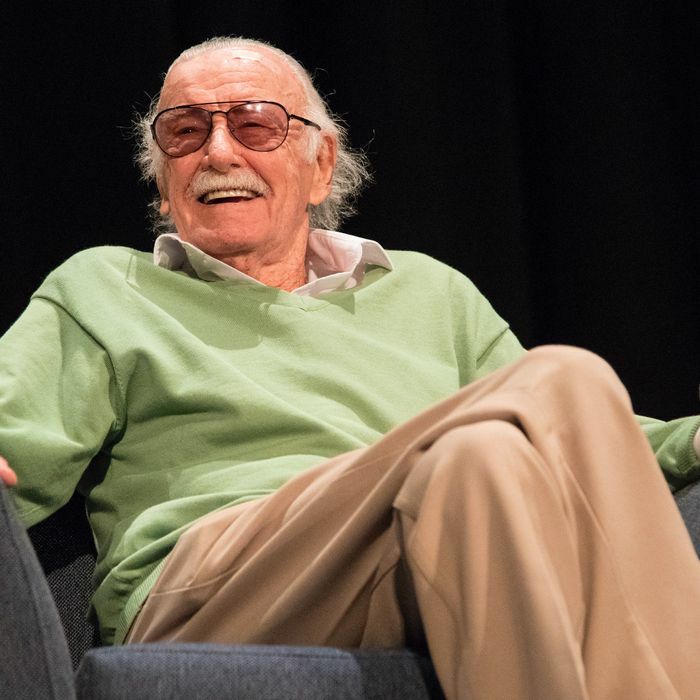 Smilin’ Stan Lee — co-creator of dozens of famous Marvel Comics characters, longtime Marvel editor-in-chief, geek-culture impresario — was called many things in his nearly 96 years on planet Earth, but few referred to him as shy, humble, or self-effacing. He was one of the all-time great salesmen, always good for a pithy boast about the superhero characters he co-created and the one character he created all by himself: Stan Lee. And yet, in the sarcastic end of that autobiographical passage, we’re left wondering: How self-aware was this man? Did he know why his greatest collaborators hated him? Did he understand his mixed reputation among comics historians and journalists? Did he get why he made the poor business decisions that left him a much poorer man than he should have been? When he looked in the mirror in his final days, what did he see? They were, to be sure, sad final days, ones hardly befitting a cultural giant of his stature. True, the man born Stanley Lieber didn’t die destitute like far too many other comics pros of his generation. However, his death is only the most recent in a long string of sad news items lately associated with his name. He was the rare man in entertainment for whom accusations of sexual misconduct weren’t even the worst of his problems this past year. His biggest worries were legal, familial, and above all financial. “One of my lifelong regrets is that I’ve always been too casual about money,” he wrote in Excelsior!, and that truth became all too apparent in his twilight. Ever since the death of his beloved wife Joan in 2017, Lee’s life had spiraled into disrepair. He’d already been involved in two dead-end companies after he left active duty at Marvel in the 1990s, Stan Lee Media and POW! Entertainment. Then things got worse. It’s not worth getting into the lurid details because virtually none of them are proven, but suffice it to say that dispatches from Lee’s world revealed a man being drawn and quartered by those he’d previously trusted. His daughter and an array of people who had worked closely with him each claimed that all the others were trying to bilk Lee out of his fortune. Just a few weeks ago, Lee did an interview with the Daily Beast that revealed a somewhat broken man with only a limited awareness of what was happening around him. Lee was not going out in quietude and peace. That messiness was too much for even Lee’s detractors to publicly revel in. But that doesn’t mean they forgave him. Although the general population never stopped viewing Lee as their kooky great-uncle, cheering him along whenever he made one of his film and television cameos (he’d already filmed a few for still-upcoming Marvel projects, so expect more than a few tears in the cineplex in months to come), certain sectors of the comics world looked upon him as more villain than hero. The key accusation there was that he didn’t do right by his collaborators, that his own self-aggrandizement took precedence over proper acknowledgment of the people who got him to the top. Lee was a writer on the comics that made him a household name — but he wasn’t the only one. He and a visual artist would come up with a loose plot for an issue, then he’d send the artist along to devise the concrete story and lay it all out in page after page of artwork. Only after that would Lee pop back into the process, writing up specific words for the characters and narrators to think and say. These artists were co-writers by any sensible definition of the term, yet Lee preferred to bill them merely as artists and would put himself first in the credits as the sole writer of each story. What’s more, he rarely bothered to correct people when they wrote or said that he was the sole creator of Spider-Man, the Avengers, the X-Men, and the like, even though each of those characters had an artist who was just as responsible for their genesis as he was. Later in life, he caved and started referring to writer/artists like Steve Ditko and Jack Kirby as co-creators. But even then, he would often follow that up by saying he still thought he deserved the lion’s share of the credit. There are thus those who argue that he deserves none of the credit. They are mistaken. Though Lee talked himself up more than he should have, he had an incredible impact on the course of international popular culture. He may have only been writing the words late in the game of the creation of a story, but what words they were. Lee was able to wring humor and pathos out of his characters in ways no one had successfully tried prior to the Marvel revolution of the 1960s. His Spider-Man stories with Ditko would feature side-splitting bits about wackiness, like Spidey trying to cash a check while in costume; then they’d make elegant left turns into oft-quoted ruminations on power and responsibility. His Fantastic Four fables with Kirby could wow you with Mr. Fantastic’s cosmic science-babble and move you with the Thing’s sorrowful pondering of cruel fate. Lee’s words sparkled even more in the letters columns and promotional backmatter of those Marvel classics. There, he would perform another great trick, which was stoking the fires of fandom. From the perch of his soapbox, he would write deliciously witty notes to fans and haters, gleefully chat up his company’s work and playfully diss that of its “distinguished competition,” and hand out what he called “No-Prizes” — awards for readers who could come up with the best in-universe explanation for his inadvertent plot holes. It’s hard to explain how nutso people went over those disarmingly informal interactions. Ditko and Kirby were unbelievable writer/artists, but neither of them had anything even resembling Lee’s deftness with hype. Without him, these books wouldn’t have been in front of all the impressionable young eyeballs they caught in those world-altering years. His tending of that fire turned the entire medium of comics and genre of superhero fiction around at a time when such leadership was direly needed for their very survival. We can also credit him with the innovation of the shared universe. Although there had been plenty of crossovers in superhero comics prior to the Marvel revolution, they had been haphazard affairs with no architecture to them. Lee was the one who decided to put all the Marvel figures into the same New York City, where they’d run into one another and advance not just their individual plots, but the larger course of the entire Marvel universe, which he oversaw as editor-in-chief and writer. It was a great sales gimmick — Gotta buy ‘em all if you wanna know what’s happening in any one of ‘em, True Believer! — but it was also a brilliant new way to tell an epic saga through the interweaving of disparate, seemingly unrelated narrative strands. These days, such shared universes are what every studio in Hollywood is attempting to create. It makes sense that the only one to actually take off so far has been the one starring Lee’s characters. But even those movies were, in a way, cold comfort for the late Lee. He was an executive producer on all of them, but he never had ownership of the underlying IP and thus couldn’t make all the money one might have expected him to make, given the success of his co-creations. He got to make cameos in the pictures, but he never actually had any creative input on them. Performers and filmmakers spoke reverently of him, but they never talked about the weird, failed projects he was still working on. While the Chrises Hemsworth, Pratt, and Evans were soaking up adulation through social media, Lee was still hoofing it to comic conventions well into his 90s, signing hundreds of paid autographs until he would nearly collapse with exhaustion. It was never totally clear why he needed to still be hustling at that advanced age. “Needed” is a complicated word in this context. In his final days, did people need odd, fizzled forays like Stan Lee’s Mighty 7 or Stan Lee’s Hero Command? Probably not. But did we still need Stan Lee? I’d say yes. He was a link to the earliest days of the American comic book. He remained one of the best showmen in the culture industry. His story was a constant testament to what comics and superheroes could achieve in the marketplace — as well as a reminder of the ways that marketplace had failed so many of his co-workers. His legacy will have asterisks, yes, but he gave more than he took. He was an American original, boldly facing the future when others would have slunk into mere ruminations about the past. “I may not always have been right,” he wrote in Excelsior!, “but I never argued with my own decisions.” There will always be more to discuss about Stan Lee, but for now, let us say: ’Nuff said. Why Is Stan Lee’s Legacy in Question?